Peace is not a word one would use to describe Kashmir, a region that continues to rail against against Indian governance and military occupation. But peace is what one feels on Dal Lake, the sprawling body of water that dominates Srinagar, the summer capital of the state. Its calm surface is fringed by numerous brightly painted wooden houseboats, its banks lined with lush chinar trees. Like the surface of the lake itself hiding that which is underneath, this picturesque tranquility belies the issues currently facing the lake and its inhabitants - not to mention the people of greater Kashmir. The lush Kashmir region is part of India’s northernmost state, bordering Pakistan and China. Historically the name referred to the Kashmir Valley, also more poetically referred to as the Vale of Kashmir. The state is officially known as Jammu and Kashmir or more colloquially as “J&K”, and as well as the Kashmir Valley it encompasses the regions of Jammu to the south as well as Ladakh, ethnically and culturally Tibetan, in the east. We visited Kashmir twice during our travels in India, falling in love with the beautiful yet troubled province, and spent a total of three months there. With dramatic vistas of the Himalayas, dense forests and languid waterways, Kashmir’s natural beauty is, for want of a better word, breathtaking. Before we discuss the lake, it’s important to take a brief (as is possible) look at the recent history of Kashmir in order to understand the importance of its natural resources and the issues the community grapple with. Following the Partition of India and dissolution of the British Raj 1947, a line of control was drawn through Kashmir. The southern chunk of Kashmir fell under Indian governance, while Azad Kashmir in the north-west went to Pakistan. The north-east region of Kashmir is currently controlled by China. Since India gained independence from Britain, both Pakistan and India have contested control of Kashmir leading to ongoing military and political conflict, notably the Indo-Pakistani War of 1947–1948, the Indo-Pakistani War of 1965, and the Indo-Pakistani war of 1999 (also known as the Kargil War). This conflict has flared up again recently, following an attack in Kashmir and air strikes on Pakistan by India. Although previously a princely state, during the Partition Kashmir’s reigning monarch Hari Singh agreed to temporarily accede to Indian control, under condition of a later referendum on their independence (which, although promised, never occurred). This lack of political and economic sovereignty is one of the sources of the conflict in the region, as the state and its people experience heavy military occupation and highly vocal separatist movement. For a region with cultural and religious conflict swirling in both its history and present, it’s worth noting how the demographic spread varies throughout the state. The majority of the Kashmir Valley’s four million inhabitants are Muslim (most Sunni) with a 4% minority of Hindus who are known as Kashmiri Pandits, while the southern Jammu region (home to state’s winter capital) has a Hindu majority of 66% in its population 3 million. The Ladakh region in the east is home to another 250,000 - the slim majority of which are Buddhist. (Statistics from the BBC). Srinagar is the summer capital of Jammu & Kashmir, lying in the picturesque Kashmir Valley. Full of trees and lush parks, the city is also famous for its many bridges. Tuktuks, cars and scooters are plentiful, though most people get around on foot. Nomadic Gujurs regularly drive their herds of sheep and goats through the main streets, halting traffic and adding to the chaos of the countless militarily guarded intersections. Many of the older houses are wooden, as is the famous Shah-e-Hamadan Masjid mosque, which boasts a construction apparently devoid of nails. The Jhelum River winds lazily through Srinagar, lined by trees and home to some of the city’s houseboats. But the natural beauty of the city sits jarringly alongside the tangible reminders of the regions turbulent history. Its streets are lined with armed soldiers and police, with clusters at nearly every intersection. There are more than 500,000 security forces in the Kashmir region and their presence is so numerous that many of the hotels that line the lakeside in Srinagar, once part of the vibrant tourism industry, now serve as residences for the military. At the heart of all the bustle is the calm waters of Dal Lake, the subject of this piece, a body of water lauded by many as the “jewel in the crown of Kashmir”. It’s anglicised name is a misnomer of sorts, as ‘dal’ means lake in Kashmiri. Its surface is covered in water lilies and other aquatic plants, and the origins of the lake are thought to be either glacial or fluvial, with scientists undecided. The greater Dal Lake area consists of wetlands and three basins - Gagribal, Lokut Dal, Bod Dal - as well as adjacent Lake Nagin. Not only a handsome visual anchor for the city, the lakes also hold economic weight for the people of Srinagar - driving much of the city’s tourism, as well as agricultural industry. However its famously picturesque appearance belies a host of ecological and social issues - more on those later. Stationary houseboats flank much of the lake’s edge and sprawl into its centre, with names like Fairy Land and New New York. Some date back to the early twentieth century, and all vary widely in design and quality, from intricately carved and painted “floating palaces” with lavish interiors, to more simple builds of raw wood. It was a charming example of the latter that we found ourselves in during our visit, named Shora Palace, drinking in the rich scent of timber as the lake's waters lapped quietly outside our door. While the boating industry and haenz/hanji (water dweller) community of Kashmir are ancient, the houseboats we recognise today date back to the British colonial period in India. 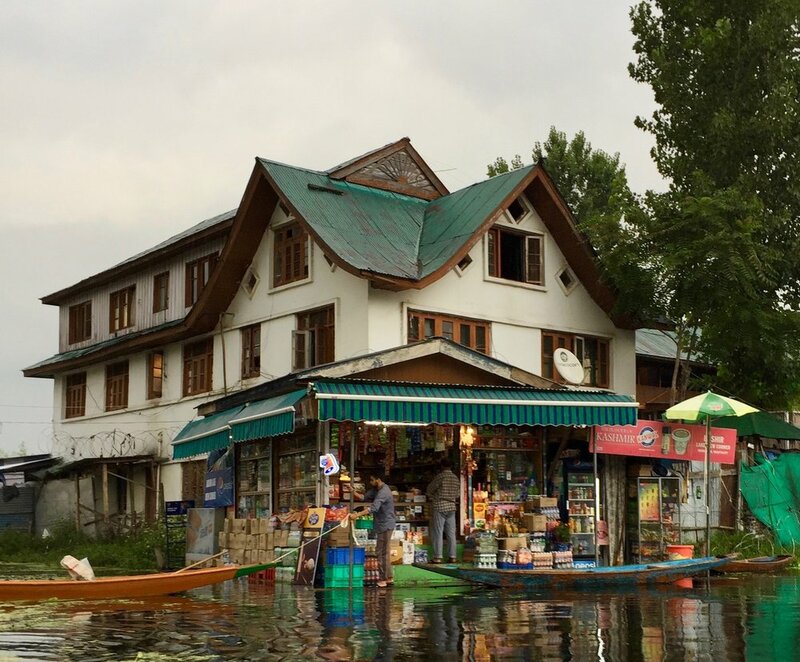 The British were banned from owning land in Kashmir and so seeing a demand, locals built and sold or rented the houseboats, utilising this legal and semantic loophole. This restriction prevails; non-Kashmiris are still forbidden from owning land, a right protected by article 35A of the Constitution. The story goes that the first of these modern houseboats (as opposed to traditional doongas) were created by a local Kashmiri Pandit Naraindas and British Army officer known as M.T. Kennard, and that the former established a successful business creating houseboats. Unsurprisingly they were instantly popular, with many British and Europeans making Kashmir their holiday destination to escape the scorching Indian summer. There are currently over 900 houseboats in Srinagar, of which the majority can be found onDal Lake. Nearly 38,000 people reside within the lake area and the houseboats can accommodate a further 10,000. The majority are rented to tourists, however many of the lakes permanent residents still live on boats and floating houses in the lake’s mohallas (colonies). With tourist numbers plummeting in recent years, permanent residents currently make up the majority of its inhabitants. 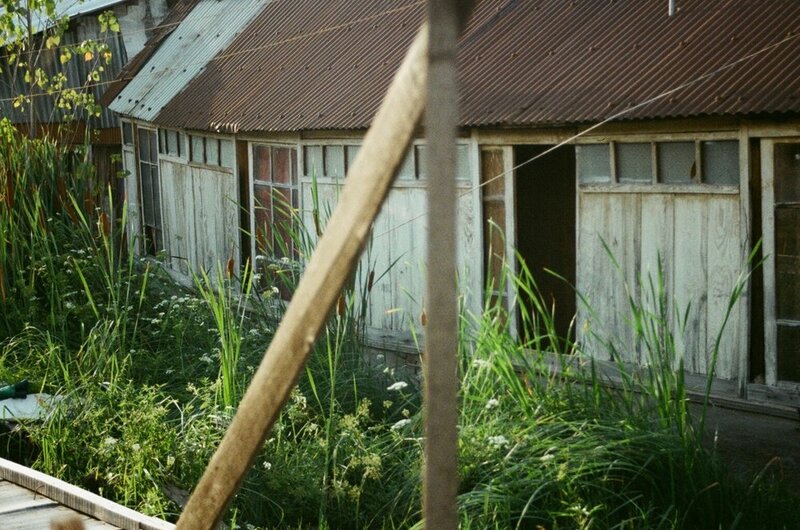 Houseboats are vulnerable to the environment. Whenever there is a storm or even heavy rain, their power sources are shut off to prevent a fire - the result of which, on a small wooden houseboat, would be devastating. Snowfall too is a fact of life during Kashmir’s icy winters, our host Shafi explained that whenever it snows (even at night) he must climb onto the roof to clear it off and prevent the weighed-down boat sinking. The natural elements take their tole on these boats; the number of has suffered a considerable decline over last 15 years, as more than 100 decomposed or sank and were never allowed to be rebuilt due to a ban on the construction or reconstruction of houseboats. As well as houseboats, equally numerous on the lake are shikaras: long thin boats, brightly painted and featuring a canopy - they ferry people to and from the houseboats or across the lake. The shikara boatmen line the main boulevard, and each boat has a designated numbered ghat (stepped entrance to the lakeside). Countless merchants peddle their wares by shikara too, selling everything from batteries to fruit, flowers and jewellery, or offering wet shaves and haircuts. The floating gardens of Dal Lake are famous, and an enduring tourist draw - as is the floating market or ‘Guder’ that occurs in the murky light of dawn. Fruits and vegetables like tomatoes, cucumbers and melons and pumpkins are grown in the lake on matted slabs of earth and vegetation. Many families are economically dependent on these gardens; according to Ghulam Rasool Akhooon, president of the Dal Dwellers Welfare Union, as of 2015 there were over 40,000 people associated with this trade. Fishing is popular too, with many subsistence fishers relying on the lake’s stock. Carp were introduced in the 1970s and now make up the majority of fish caught in the lake. The Department of Fisheries restocks the lake annually to balance the fish count and support local fishers, but the recent increase in pollution has led to a decline in the number and quality of fish stock. There are 939 registered fishermen who are allowed to fish between dawn and dusk. Fishing at night is illegal and considered poaching, as is fishing by unregistered persons. 10,000 illegal nets have been seized in the last two years. Tourism has an entrenched history in Kashmir - a vital economy that, although now a trickle, still endures. The lake has been a beloved holiday spot since the Mughal period, and it was the Mughals who developed many of Srinagar’s famous gardens that are still flocked by tourists and locals alike. Srinagar was a popular destination for the British during the colonial period, following which many Western tourists would visit Dal Lake and the greater Kashmir Valley seeking its natural beauty, gentle climate and unique handicrafts. The region became increasingly economically reliant on tourists as the industry flourished, but their numbers began to drop in the early 1990s when Kashmiris revolted against the Indian State. The economy of the tourism industry is protected as part of article 35A of the Constitution, which itself is under threat as the Indian Government looks to overturn this law that protects the property rights of Kashmiris. There are currently travel warnings in place regarding Kashmir, with many governments warning against visiting the region. Ignoring these warnings and trusting our gut instinct instead, we travelled there anyway - and couldn’t be more glad that we did. We met other tourists during our visit, both international and domestic, and most were drawn there by the same reasons we were - trekking, nature and an interest in the rich socio-cultural tapestry of Kashmir. Like us, many tourists choose to stay on houseboats on Dal Lake for at least part of their visit. Tourism is not the only thing decreasing in size; the lake itself is shrinking too, due to space occupied by dwellings and floating gardens, as well as reclaimed land and the accumulation of sediments in the lake bed. The general consensus is that the lake has shrunk from 31 square kilometres in 1859 to 24 square kilometres in 2014. Algae is one of the main ecological issues plaguing the lake, with eutrophication caused by detergents, fertilizers, and sewage leading to the excessive growth of plants and algae - choking and unrelenting. Untreated effluent drains into the lake from sewage pipes and houseboats, and those picturesque floating gardens require chemical fertilizers and pesticides, the remnants of which are released into the water. 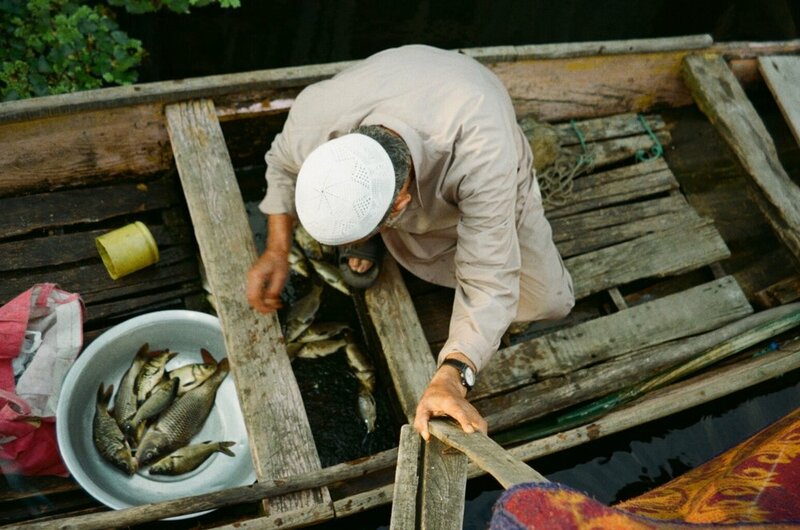 Eutrophication and the decline of water quality has had a profound impact on the people of Srinagar, affecting both commercial and subsistence fishers, and the vitally important tourism industry. Every day government funded boats mechanically pull weeds from the lake, as well as many laborers undertaking the process manually - hauling the vegetation from its endless cycle of growth. Piles of weeds sit by the side of the road in the hot sun, before being taken to designated offloading areas. Houseboat owners too spend a great deal of time clearing excessive weeds by hand from around their dwelling to ensure they still have access to the body of water. Earlier this year the High Court directed the government to investigate the commercial viability of utilising these weeds, myriophyllum spicatum, for the pharmaceutical and cosmetic industries rather than just dumping them. Unsurprisingly, garbage also makes its way into the lake, with aluminium cans and plastic bags a familiar sight as they float stagnantly in the water and are entwined in the weeds. During our time there, I only saw the collection of this rubbish once - by a lone old man in a shikara - although we assume (and hope) there are others undertaking this task too. Countless signs flank the lake, desperately urging people not to use polythene bags. Following last year’s Eid celebrations, sheepskins and offal were added to the lakes floating garbage - due to a drop in the demand and price for the hides. While blame falls on the Dal dwellers, the reality is that the source of the pollution is the greater population of Srinagar and the government’s management of sewage and waste. Srinagar produces 201 million litres of sewage daily, according to the Jammu and Kashmir State Pollution Control Board, but the old sewage treatment plants the city relies on can only process 53.8 million litres of that; the rest goes into the lake and surrounding waterways. As well as polluting the lake, untreated sewage contains nitrates and phosphates that further exacerbate the eutrophication problem. Although upgrading these sewage treatment centres is urgent (and long overdue) the Lakes and Waterways Development Authority (LAWDA) cite lack of funds for the controversial delay in action. In response to the human impact on the lake, there are resettlement plans underway for many of the people living on the lake and its waterways. This resettlement policy is understandably a contentious issue, as many have lived there for generations amidst a tight-knit community and draw their livelihood from the lake as well as their identity. In 2015 Rising Kashmir reported that 62% of people living within Dal lake claim ownership rights on its floating land, and around 25% claim ownership rights on the water area. According to government, 1370 houses and structures have been raised without permission. The minister also said that 1298 houses and structures have been demolished. The government provides a limited cash compensation to those who relocate, and have established new colonies for them to live in. However Dal dwellers insist that some of these colonies, like Rakhi Arth, lack proper facilities. That colony is built on marshy land and houses are apparently already cracked. It is meant to feature amenities and facilities like schools, public parks, hospitals and mosques - none of which have been built yet. Its community is also plagued with water shortages. Many of its inhabitants have historically relied on the lake for income, from the likes of agriculture and tourism, and call for employment initiatives to replace their prior source of earnings as they find themselves even more economically vulnerable. In March 2019, the High Court stated that “unless and until proper facilities are in place, the rehabilitation process cannot be initiated” and directed the government and LAWDA - who sit under the Housing and Urban Development Department (H&UDD) umbrella - to create proper facilities and infrastructure before lake dwellers could be resettled. Additionally, the court insisted LAWDA create a clear roadmap of their resettlement and rehabilitation plan. In 2005 the Dole Demb project was initiated, aiming to shift the houseboats to a different area of the lake, but as of last year nothing had happened - according to senior counsel Zaffar Shah during a public interest litigation. In November a committee of experts reported to the J&K High Court, advising urgent action to rehabilitate the lake, warning that it “would not exist” in its present form in 30 years time. They stressed its importance to the people of Kashmir for climatological, ecological, economic and socio-cultural reasons. As well as comprehensive sewage management by the government, they believe that the cultivation of vegetables on the lake needs to be ceased completely and immediately. Also in November, news outlet Greater Kashmir reported that 3.8 billion rupees (roughly 77 million New Zealand dollars) allocated to Jammu and Kashmir for the conservation of the lake had not been spent. Acknowledging the important role that agriculture plays to the economic wellbeing of the local community, as well as the impacts of pesticide and fertilizer runoff into the lake, Vice Chancellor Nazeer Ahmed of Sher-i-Kashmir University of Agriculture Science and Technology stated that he had directed scientists at the university to prioritise research and promotion of organic vegetable production around Dal Lake, as well as supporting the needs of growers. To combat the problem of human waste, the J&K High Court also directed LAWDA to issue notices asking all commercial establishments to cease releasing any sewage or sullage into the lake or its tributaries, and instead install environmental friendly treatments of sewage and grey water. LAWDA have been asked to immediately assess the optimum number of houseboats which could be permitted to be anchored in the Dal Lake - acknowledging their importance. The court has said that if the existing number of houseboats is beyond the ideal number, then the licences which lapse should not be renewed. Illegal houseboats (those that are unregistered) were ordered to be removed. It’s yet to be seen how any technical improvements will unfold, as the owners and operators of these houseboats are essentially economically crippled due to crashing tourist numbers. Hearteningly, a grassroots movement around the sustainability of the lake is also growing, much of it youth-driven, with the ‘Save Dal Campaign’ fighting to preserve and save this body of water. The campaign works with NGOs like ELFA International on cleanup drives with the community, while also raising awareness among the people living in the catchment areas about the historical, economic and ecological importance of Dal Lake. Near the end of our stay, we watched the blood moon eclipse from the edge of our boat. A phenomenon that seemed eerily appropriate in a region weary of conflict and challenges. A few months after we left Kashmir, the lake too was swathed in red - engulfed in a toxic red algal bloom. As with every issue facing Kashmir, days continue to unfold regardless. The houseboats are still there. People still swim and fish, hoping for more tourists to come, hoping for change - and expressing a sentiment we heard frequently in Kashmir “inshallah” (God willing). Source Material: A beloved dress, and a journey to its origin.